A systematic approach to internal controls is key in identifying the risks and controls facing an organization. The ability to effectively manage these parameters results in greater degree of control and optimal financial management. 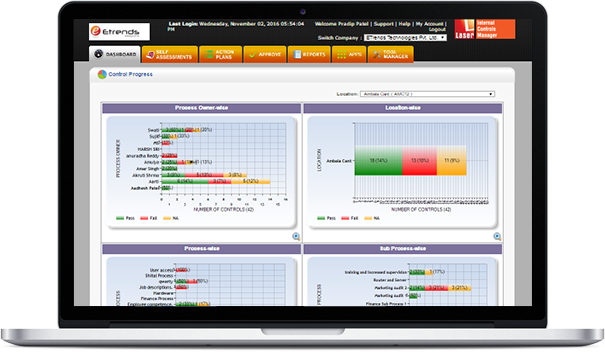 The Laser Internal Controls Manager (LICM™) is a fully integrated web-based solution that gives you the status of all Internal Controls and Financial Controls in an organization thus giving assurance to the senior management in real time. Aligned with the COSO 2013 framework and Institute of Internal Auditors (IIA) standards, it helps you implement an effective internal controls framework across the enterprise, providing a unique perspective on current business challenges. Real time information about Internal Controls across the organization. Get real-time completion status of ongoing open action plans at all locations. Effectively plan Audits for Internal and Financial Controls based on control self assessments location wise. Capture information such as incidents, indicators, assessment responses and action management in a flexible and connected manner. Rapid implementation and risk-based approach to internal controls. Real time status of Internal Controls across the organization. Review the progress of all open action plans at a single glance. Owners can participate in the assessment and certification of controls. To download the features of LICM™ etc features, please click here.